'MAY' $SAVINGS$ ... LOCATION/METRO/PARKING/MINUTES TO DC/BEST IN ITS CLASS! CREDIT CARD PAYMENTS ONLY. E-CHECKS NOT ACCEPTED (COSTLY FOR BOTH OF US)! SPLIT PAYMENTS OVER $500 ARE ACCEPTED. AS ALWAYS, WE ARE FILLING UP FAST. DON'T DELAY. CHOOSE YOUR DATES. Explore, rest, rejuvenate, relax. Monthly rates are available and Corporate Clients are WELCOME! FREE PARKING DIRECTLY IN FRONT OF COTTAGE! WALK TO METRO. 15 minute walk to either King Street or Braddock Road Metros. WALK TO OLD TOWN, ALEXANDRIA; DEL RAY; FARMER'S MARKET; RESTAURANTS. LIGHT & AIRY. FULL KITCHEN/WASHER & DRYER/PATIO/GAS GRILL/FENCED IN YARD; AC & HEAT/CEILING FAN/LOTS OF AMENITIES! PRIVATE ENTRANCES. Beautiful/Upscale neighborhood; WALK to Metro; enjoy your own Patio area with Grill; beautiful landscaping; premium+ channels (DirecTV); fassSST/STRONG WiFi; and so much MORE! (Perfect for 2). King Street and Braddock Road Metros (10 minute walk). AC & Heating throughout. 3 private entrances & 2 levels of absolute charm. We will supply a very comfortable Auto-inflatable Aero Mattress and all the bedding for the third or fourth guest. Unpack your bags & stroll into Old Town. 10 minutes away from THE NEW MGM at NATIONAL HARBOR!!! Walk to local Coffee Shops, Del Ray Farmer's Market, Sushi, Pizza, Italian, Ethiopian, French, Organic Health Food Cafe. Large selection of restaurants to please your palate. Conveniently located in a quiet/safe upper-class neighborhood. A runner's and cyclist's dream. Main Level: Combo Living Room/Bedroom w/FLAT SCREEN TV/DVD. Open & airy. Hardwood floors & Full bath. Furnishings include: Trundle bed converts into KING-SIZE w/top-of-the line and very comfortable mattress; Dresser; DVD; Clock Radio. A select number of DVD's are provided for your viewing pleasure. Lower Level: FULL KITCHEN w/FLAT SCREEN TV/DVD (PREMIUM package for sports and entertainment). Marble floors throughout. Separate Laundry Room! Our Cottage is PERFECT for all travelers desiring the feel of a 'Home away from Home' environment. More amenities & PRIVACY than a Hotel! We offer a very CLEAN environment. Fluffy pillows; towels; soaps; body wash; Q-tips; cotton balls; shampoo; conditioner; hair dryer; iron/ironing board; coffee; tea & hot chocolate. Ride the TROLLEY into Old Town & enjoy many shops, cafes & restaurants, The Torpedo Factory & the Waterfront. Mins. to downtown Washington DC, Pentagon, Roslyn, & Crystal City. We go the extra mile to make sure your stay is most enjoyable! CHECK OUR REVIEWS. WHERE ELSE are you going to find ALL OF THIS at this price, along with convenience, parking, METRO and a WELCOMING atmosphere? We have been opening up our Cottage from time to time and have enjoyed meeting so many nice people. When we open up our Cottage, we want our visitors to have a unique and memorable experience. If you have a good experience with us, you'll come back and you will also tell your friends about us! Alexandria is FULL of history and conveniently located to downtown Washington, DC. You will LOVE our neighborhood. Lots of beautiful homes and well-maintained. Two choices of Metros, that can be reached within 12 minutes by foot. Amtrak Alexandria Union Station is about a 15 minute walk to and from the Cottage. So MANY conveniences. Staying at The Cottage vs. a Hotel room. We offer the following: Kitchen Prepare gourmet meals or a Thanksgiving feast. The Cottage is fully equipped with all you need to prepare meals for families with small children and people with special dietary needs. Vacationing on a Budget? Eating at home leaves more money for shopping and area attractions. Space The Cottage allows you to relax in private (indoors or out). Enjoy the beautifully landscaped Patio with Weber Gas Grill. More than two guests? We will supply either a very comfortable TWIN or Queen Aero Mattress with all the bedding. Sleeps very comfortably. Privacy Your own PRIVATE ENTRANCE .... No need to hang out the “ do not disturb ” sign. For a romantic getaway or a 'get away from it all.' YOU decide when you want to wake up. Luxurious Extras We supply shampoo, conditioner, cotton balls, Q-tips and so much more. Laundry Separate Laundry Room where you can wash, dry and fold. We even supply the detergent and dryer sheets. Convenience Walk to King Street Metro or stroll into Old Town, Alexandria A/C and Heating! toilet, shower, Full bathroom and GREAT water pressure. Window. FULL BATHROOM WITH WINDOW. EXCELLENT WATER PRESSURE. YOU WILL NOT BE DISAPPOINTED! Bed sheets (400 count); fluffy pillows, luxury bath towels, kitchen towels, etc. Laundry Room with FULL SIZE Washer. Laundry Room with FULL SIZE Dryer. All the towels you will need will be in the Cottage (FRESH). Free Wi-Fi (Code will be given when you arrive). 2 offerings. Full Brew Maker or Single cup serving. 2 Slice for Toast or Bagels. All the spices you will need to make a gourmet meal. Pots, pans, cutlery, wine glasses, etc. All new appliances, marble floors, spices, pots, pans, mixer, chopper - everything you need to prepare a wonderful home-cooked meal. 2 FLATSCREEN TV's with HBO Channels, ESPN and so many more. 10 or more complimentary DVD's in Cottage for viewing entertainment. Enjoy outdoor dining on this beautiful stone patio. Table w/4 chairs and adjustable umbrella & lights in private fenced-in yard. The Cottage is perfect for 2. Can accommodate 4. My stay at the cottage was perfect! Jack is super prompt with n responding to any questions or needs. The cottage was great for me and the location was super convenient. I loved being in a quiet, beautiful neighborhood. This was a great location for the 4 of us who wanted to see Washington DC. 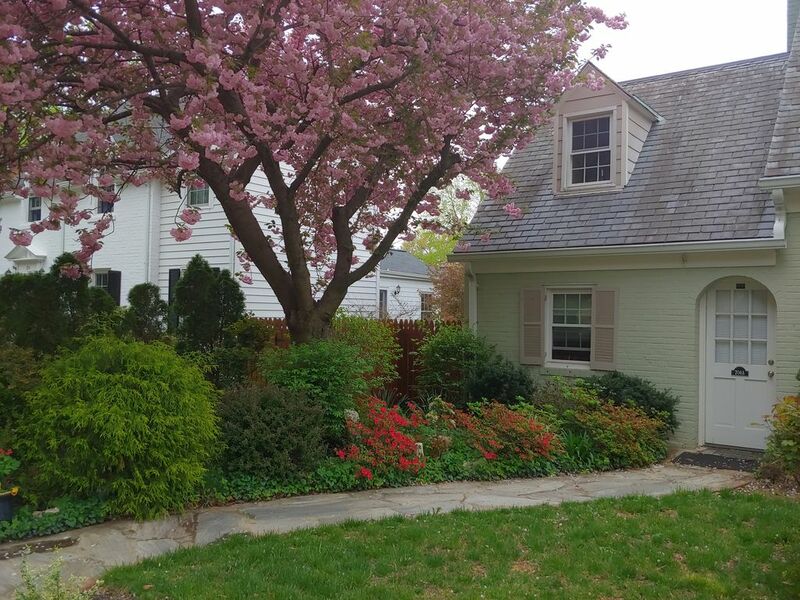 Very safe and attractive neighborhood, Metro and old town Alexandria in walking distance, free parking on the street, laundry access if we needed it, our kind host to answer any questions. Our stay at "The Cottage" was absolutely wonderful. It is close to the metro, good neighborhood, and quiet. Jack was great!! Peaceful, private and cozy cottage. Enjoyed our stay here. Location is very safe feeling. Nice neighborhood. Enjoyed our visit. We really didn't have nice weather (two days of cold damp rain), but still enjoyed our visit. Close to metro, King St. would recommend the cottage and Jack's great care. It was an ABSOLUTE pleasure to host you. Please return. Wonderful, cozy cottage that was perfect for us!! We miss it already! First of all, the owner, Jack, is absolutely amazing....we had a redeye flight and we were greeted with muffins and juice after a long flight. He is there for you and can answer all questions. Additionally, he has two dogs who give us dog lovers lots of love! The cottage is clean and cozy....the kitchen has EVERYTHING you need for cooking. Finally, the backyard is peaceful and calm with the white lights and candles....perfect for sipping wine after a day in the city. We were lucky enough to have snow during our stay so we really enjoyed sitting outside and watching the snow/rain....we are from Southern California so we love anything other than sun! Also, the neighborhood is GORGEOUS....we took several walks just looking at the beautiful homes. You will not go wrong when you book this perfect cottage!! We LOVED it!!!! Our host, Jack, was a great guy. We loved his dogs. The neighborhood was quiet. I would suggest somewhat that if you stay that you make certain that you are not parallel-parking challenged. Since the kitchen is downstairs make certain that stairs will not be an issue. Jack was indispensable in the raising of the bed. It was nice hosting the two of you. Glad to assist with the bed and anything else my visitors need. Minutes to DC via METRO. 10 min. walk to King St. Metro Station; 7 miles to Reagan National Airport, Amtrak (Alexandria Station). 1.4 miles to the new 'National Harbor'. Crystal City & Pentagon are all nearby. FREE WI-FI!!! Lots of BIKE TRIALS and Bike Rentals!!! You can safely store your bikes on property. Within walking distance...Shops & Restaurants; Whole Foods; Harris Teeter; Trader Joe's; Pharmacies; Y.M.C.A., Parks, Tennis & basketball courts.